Tonight I was wondering who the healthiest people in the world are. So I googled. I especially liked the 115 year old lady. I found it interesting that her key to health was to mind her own business - Great advice!! "They are the Sardinians, residents of the Mediterranean island of Sardinia, the Okinawans, who live on the island of Okinawa off the coast of Japan, and a religious group, the Seventh Day Adventists. Each of these groups keeps a low-calorie diet composed primarily of fruits and vegetables. The group of islanders doesn't strictly follow the caveman pattern, though. They do eat some grains, mostly in the form of noodles, bread, and rice -- and just about all of them are whole grains. The Sardinians and Seventh Day Adventists eat in a similar manner. And as a group, they not only experience an amazing longevity, but experience very few degenerative diseases such as cancer, heart disease, diabetes and so on and so on. This diet has been shown to reduce high blood pressure, reduce high triglyceride counts because you are not eating starches and allows your body to better regulate insulin which helps the diabetic person." I found this recipe last month and just had to try it! It was time consuming (mostly because it took me more than 5 minutes) but so yummy! They taste pretty close to the Little Debbie Oatmeal Cream Pies, but I think they taste better. AND you can actually say what the ingredients are - they are real foods! The kids even liked it. This was also a great recipe from the same website. Sunday salads are my very favorite. I usually like to dress them up a bit more than during the week. Maybe it's because I have a little extra time. And I look forward to it every week. We go eat at the in-laws every Sunday for dinner. And 90% of the time I bring a salad. I don't know if I have ever brought the same salad twice - well, maybe I have. I usually do a bed of greens. Romaine hearts. Spring mix. Maybe some spinach. And I especially love my little helper. She loves to make salads and she is pretty good at it too! Can't wait til Sunday to see what the next salad creation will be. I love going to Alpine and one of my favorite things to do is to go to the library there. I love to check out books and read. This book was sitting on a table and I just had to get it. 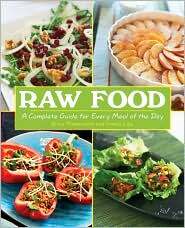 Raw Food is something that has sparked an interest in me lately. I loved the pictures. The food looks so yummy. I have even tried some of the recipes. 1. First, put pear into blender; then add banana and then the apple. Blending the fruit in this order prevents the mixture from getting too sticky. 2. Sprinkle the cinnamon and flaxseed over the mixture. Wow! I even got a picture of this one! 1. Place walnuts in food processor and pulse until finely chopped. 3. Add honey, carob, salt and mix. Add more carob if desired. 4. Keep mixing until dough holds together enough so it is easy to roll balls. Roll in coconut flakes if desired. I have a bunch more recipes that I am excited to try. I definately recommend this book.